Fruit is nature’s candy, and we’re so grateful for each and every harvest dedicated farmers provide to us. Think about it: we know fruit is refreshing, energizing, and it tastes so good. Plus, the human body is really good at processing and digesting it. 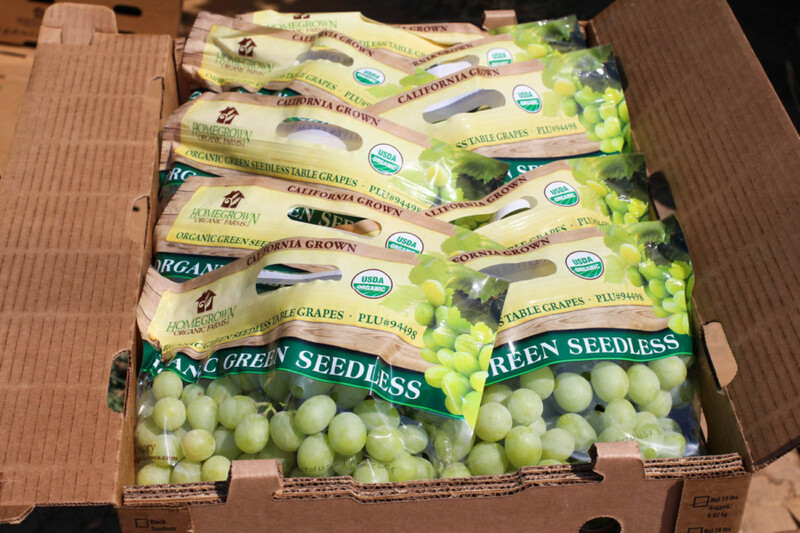 At Homegrown, we are of the belief that you can’t go wrong with organic fruit, especially grapes this time of year. Not only do they serve as an easy, tasty snack, but grapes also bring many health advantages along with them. Essentially, you would be correct in assuming that we are big grape fans. And yes, we’re hoping to pull you into the fold. There are many ways to go about incorporating more grapes. Grace your dining room table during a dinner party or grab a handful on your way out the door (it’s not good to skip breakfast!) No matter the situation, grapes are silently yet powerfully working with your body. They play an important role in feeling energized, full, and satiated. Vitamin K. An essential vitamin for good blood health. The vitamin K in grapes helps promote speedy blood clotting after suffering an injury as well as the important job of transporting calcium throughout the body. Potassium. Consuming adequate amounts of potassium helps the body fight against fatigue and weakness, all while supporting healthy blood pressure and bone strength. Grapes inject a jolt of energy into an otherwise fatigued day. Digestion. Because of their high water content, grapes can aid your digestive tract and help keep the process comfortable and efficient; On track, if you will. Bonus points if you drink water alongside your grapes, that’s another point for gut care! Each of the many grape varieties has a distinct flavor profile, unique coloring, and varying levels of sweetness. Of these thousands of grape varieties, some of the most popular include the Concord, the Crimson, and the Kelly. Amazingly, these popular eating varieties don’t touch on those used to press wine around the globe. Merlot and Syrah, for example. Grapes are as versatile as they are tasty. Include them in your parfait, salad, or in a glass of your favorite red. Going beyond varietals, grapes have a knack for flexibility, especially when examining the many ways they’re enjoyed. Grapes are delightful when fresh, frozen, dried (raisins), as wine, and, last but not least, freeze-dried (our favorite!) Thanks to unique processes like freeze-drying, grapes can be enjoyed all year long; even when they’re not in season! How do grapes fit into your life? Share your love of grapes with us on Facebook, Twitter, and Instagram for your daily dose of organic fruit!